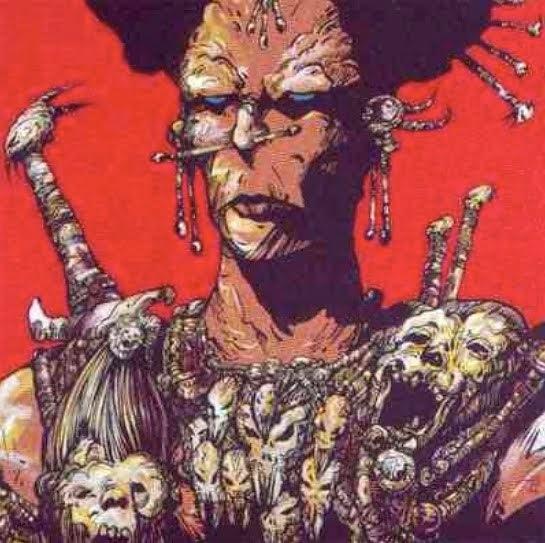 There are a surprising number of recent threads at the RPGSite discussing Chaosium’s Basic Role-playing (BRP) and Mongoose’s RuneQuest II (MRQII) systems (both of which, of course, trace their roots back to the original RuneQuest RPG). 3. The BRP Renaissance (which references my earlier post on this topic). Hopefully such discussions will help spread the word about these two excellent RPGs. Thanks to Jeff Rients for bringing my attention to the wiki ‘Links to Wisdom’. 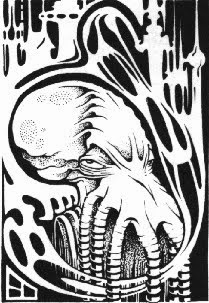 Links to Wisdom, essentially, is a depository for various OSR ('old school' D&D-related) house rules. It looks to be a great resource, and no doubt will only improve over time. I noticed a few of my house rules posted there. Thanks to those of you who kindly thought to link them! Hopefully things will lighten up soon. But for now, gentle readers, I'm feeling some significant (work-related) pressure! The remarkable Rob Conley (of the ‘Bat in the Attic’ blog, and author of the brilliant Points of Light) has made available his delightful Blackmarsh mini-setting for free over at RPGnow (go here). The format of Blackmarsh will be familiar to anyone who has read Conley’s Points of Light books from Goodman Games, his ‘Wild North’ setting from Fight On! #3, or the various Wilderlands of High Fantasy products from Judges Guild (including the revised version published by Necromancer Games a few years ago, to which Conley also contributed). Essentially, an overview of the Blackmarsh setting as a whole is provided in the opening pages of the booklet, followed by some notes on the main geographical features of the region (forests, rivers, mountain ranges, and so forth). 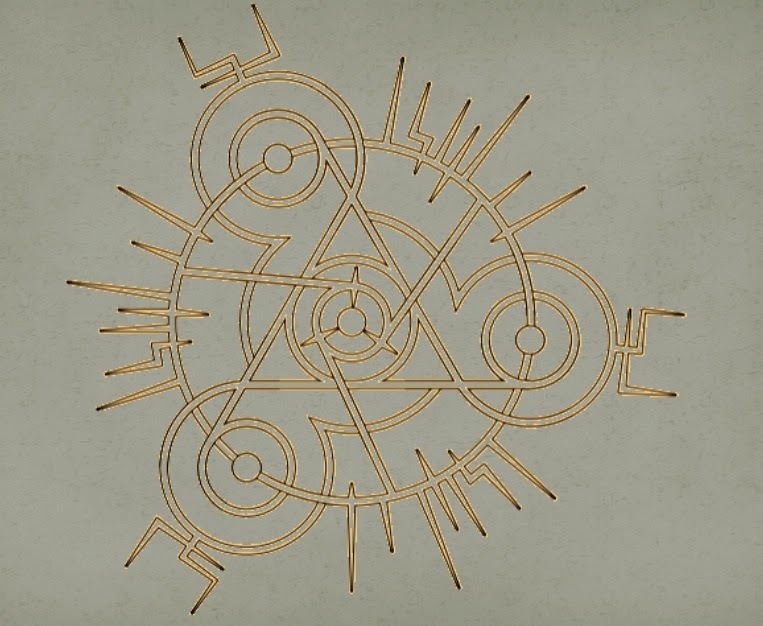 The bulk of the booklet consists of keyed entries for the hexagonal map of the Blackmarsh region (i.e., each hex is assigned a number, e.g., 1810, and about 10% of the hexes have special features that are described in the booklet, e.g., monsters, citadels, ruins, towns, etc.). A separate map is provided for Blackmarsh Castle, and it is given a more detailed description than any other region. I especially liked that a rich text version of the gazetteer was included in the download, as this greatly facilitates the ability of Game Masters to tweak different entries, and to customize the setting to their respective campaign worlds. It also enables GMs to insert appropriate game statistics, and so forth. I also appreciated that a ‘players’ map’ was included. Such maps are very helpful in promoting ‘sandbox’ style campaigns, as they give players a clear framework for open exploration. Players’ maps also help GMs determine how knowledgeable the players’ characters are of the region, by giving him or her the power to add details to the map as appropriate. 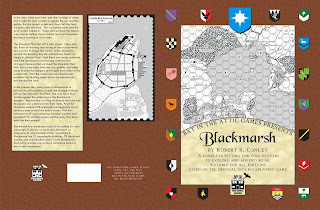 The name ‘Blackmarsh’ obviously is an homage to David Arneson’s classic ‘Blackmoor’ campaign setting. Beyond its name and general ‘northern borderland’ ethos, though, ‘Blackmarsh’ is its own thing. Blackmarsh, however, is related to some of Rob Conley’s other mini-settings: the ‘Southlands’ (from the first Points of Light book) is immediately south of Blackmarsh, and the ‘Wild North’ (from Fight On! #3) is about 100 miles to the east. The background to the setting is intriguing: apparently, two millennia ago a meteorite fell to earth (‘the Mountain that Fell’), creating the ‘Smoking Bay,’ the great bay that lies at the centre of Blackmarsh. The meteorite also scattered an element known as ‘Viz’ throughout the region. Viz is a magical substance that can be used for a variety of purposes (ultimately whatever the GM desires). Also scattered by the meteorite were various ‘weird’ alien artifacts, and even creatures – although these are not described in the book (this aspect of the setting simply is a hook for GMs to develop further, as they see fit). The non-human races – Elves, Dwarves, Halflings, Orcs, and so forth – are all pretty bog standard. Refreshingly, though, there is an organization of evil Elves, called the ‘House of Raven,’ at large in the setting. These Elves are committed to the destruction and/or subjugation of all other races (simply put, they are ‘Elf-Supremacists’). (1) The remnants of the ancient ‘Bright Empire’ (a somewhat confusing name for those familiar with Michael Moorcock’s Elric stories) live in the area around Blackmarsh Castle (which was an old ‘Bright Empire’ outpost; the Bright Empire itself collapsed about eight centuries ago). (2) The new arrivals from the expanding ‘Grand Kingdom’ to the southeast (essentially, the main ‘lawful’ human civilization of Conley’s greater setting). (3) The Vasan Vikings, who were displaced by the Grand Kingdom, and now engage in various acts of raiding and pillaging from their new headquarters in the northeastern part of Blackmarsh. (4) Finally, the recently civilized Ostrobards who occupy a small kingdom in northern Blackmarsh. Blackmarsh Castle itself was recently ruled by an evil arch-mage named Atacyl Oathbinder, who eventually was driven from Blackmarsh Castle (only to reappear later as a vampire). Before leaving, though, Atacyl apparently built some dungeons beneath the castle in order to pursue his vile magical studies. These were sealed when the castle was liberated, but obviously could serve as the basis for a few ‘dungeon crawl’ style adventures, for groups who like that sort of thing. The main ‘good’ organization in the region is the ‘Blackmarsh Rangers.’ Based in the Blackoak Castle, the Rangers are committed to fighting evil and chaos in the north. It is possible that player characters could become members of the Blackmarsh Rangers, as their membership is quite diverse, and be sent on various missions by them. Clearly, there are many adventure hooks in Blackmarsh. In addition to missions for the Blackmarsh Rangers, adventurers might search for the Viz scattered throughout the region, or perhaps the alien artifacts also scattered by the Mountain that Fell. Many ruins of the lost Bright Empire also exist, now dens of monsters or other vile things. Then there are the simmering political conflicts in the region (especially involving the Vasan Vikings and the House of Raven). And finally, of course, there are the dangerous wilds themselves, with monsters, brigands, and other dangers to be faced. In short, I highly recommend Blackmarsh! It has many interesting elements to it (e.g., the Viz), and could very easily be adapted to most fantasy settings. Even if not used ‘as is,’ the product is a short, fun, and inspirational read! After some time the sounds of brawling in the common room below died down. Shortly thereafter, our human friend, Adralat Na-Keth, appeared looking none the worse for wear, with our mighty warrior-slave Myluk behind him. Bōdric’s visage was a portrait of uncertainty as I spoke. Clearly he saw the wisdom of my proposal, but it conflicted with his naturally cautious nature. Although I did not understand Adralat’s reference to a ‘Rubicon’, the deciding vote clearly had been cast. Our course of action had been determined. We quickly positioned ourselves in an alleyway between the Frozen Gem and what looked to be a disused warehouse. Preparing our weapons, we waited for our prey in the shadows, either unnoticed or ignored by the drunken louts that wandered about the docks late that night. Hours passed. I began to marvel at the Pan Tangian’s stamina. When would our prey pass by? Was he going to spend the entire night with his fire-haired vixen? Did we prepare our ambush in the wrong location? I was quite certain that he would pass by this alleyway en route to the Black Citadel. But perhaps not? Self-doubt began to assault my mind and nerves like a persistent, pestilent beggar from Nadsokor. But still we waited. Hours passed. Countless drunken sailors and less reputable folk staggered by. Night became pre-dawn. At last, much to my profound relief, our patience was rewarded! The ectomorphic Pan Tangian and his two bulky guards finally appeared in our sights. A surge of adrenaline suddenly surged through my weary body. With remarkable precision, a bullet from my sling penetrated Nhagren’s right leg, in the back of his kneecap. With a scream of pain, the Pan Tangian crumpled to the dirty stones of the street. Myluk, Bōdric, and Adralat engaged with the two guards, first using their bows, and them engaging them with swordplay. In the meantime, the loathsome Pan Tangian whom I had crippled howled with pain. Worried that his shrill screams might attract unwanted attention, I ran up to him and uttered a rune of Sleep. Placing my hand on his prone body, Nhagren immediately fell into a sorcerous slumber. My colleagues dispatched the two guards with nary a scratch to themselves. We immediately dragged the two corpses and the sleeping Pan Tangian into the adjoining warehouse. The warehouse was divided into two parts. The room that we had entered looked unused. We deposited the bodies on the floor, and stripped the deceased guards of their armour and livery, planning to use them later if necessary. Nhagren snored on. The adjoining room reeked of slop and animals. Within it was a pen filled with muck and a number of large, squeaky pigs. Cautiously closing the door, we immediately determined a convenient way of disposing of the two bodies. With remarkable efficiency – and slightly disturbing enthusiasm – Myluk dismembered the Pan Tangian bodies and disappeared into the second room. Squeals and grunts of delight could be heard, as the pigs were delivered their unexpected feast. “Thank you for that information – I’ll be sure not to eat the pork at the Frozen Gem in the future,” I replied dryly, looking at the Pan Tangian as menacingly as possible. I began to utter my rune of Truth, the contorted eldritch High Melnibonéan words issuing from my lips in an unworldly chant. Alas, I must confess that an impish smile conquered my face as I looked at Nhagren’s deliciously frightened face! 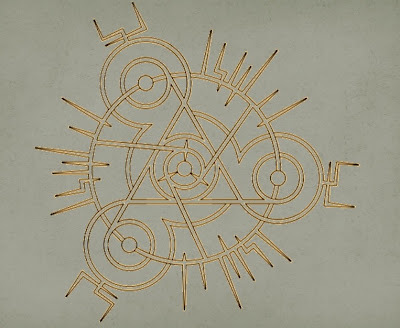 Successfully completing the rune after only three attempts – I made a point of concealing my failures with imperious glances at my victim – eldritch energies seized the mind of Nhagren, bending his will to my control. I interrogated the Pan Tangian with my sorcery, learning what I could from him, confident that my newly acquired knowledge had to be true – or at least the truth as Nhagren believed it. From Nhagren I learned that Lord Salamir was being kept by Governor Boorg to be used in his gladiatorial games. The vile sorcerer Malagan, on the other hand, held Cora-Dru in his quarters, for reasons unknown. It became clear to my colleagues and myself that liberating either captive would be most difficult. Interestingly, the Pan Tangian made us an offer. 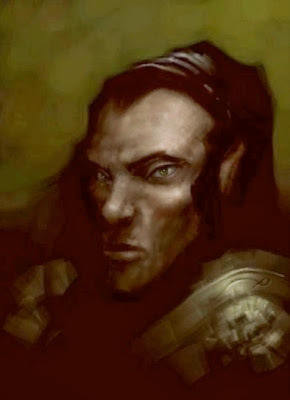 He would use the forthcoming tribute procession – during which the wealth and plunder of Ryfel would be transferred to a great black ship to be taken to Pan Tang – to mask the smuggling of Lord Salamir and Cora-Dru onto a ship under our control. In return, we would help Nhagren in his bid for power by somehow eliminating Governor Boorg and Malagan. Apparently the Pan Tangian was quite impressed with my magical talents! As a result of our discussion, we agreed – much to our surprise – to make a deal with Nhagren. The first part of our agreement involved the transfer of the courtesan Aneera to Nhagren’s possession. Apparently Aneera is a slave of the innkeeper Zheren, who delights in having this form of control over Nhagren. So we must figure out a way to liberate Aneera from Zheeren, and deposit her at Nhagren’s residency in a green gabled house in the ‘Old Side’ of Ryfel. As we shook hands in order to seal our agreement, Nhagren asked us for our names. Naturally, I used my cunning pseudonym, ‘Ilkyn Blackviper.” Adralat employed the rather strange name ‘Conan of Cimmeria,’ whereas my brother foolishly blurted out his actual name. And so we let the Pan Tangian go, our secret pact binding us all to various acts of skulduggery over the next few days. It was early dawn when we returned to the Frozen Gem. 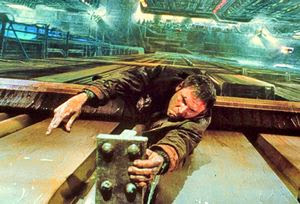 As we climbed the stairs past the second floor, Adralat reported that he sensed someone suffering a potent dream. “Yes, yes, Adralat. I think it is time for us to do some dreaming now,” replied Bōdric, obviously exhausted and irritated. When I was a young lad I was a huge fan of Hergé’s The Adventures of Tintin. When I was a few years older (but still a young lad), I became a huge fan of H. P. Lovecraft’s ‘Cthulhu Mythos’ stories (and remain a fan to this day). If only Hergé had sent Tintin, Snowy, and Captain Haddock on a few eldritch adventures involving the Great Old Ones! More of these brilliant (faux) Tintin covers can be found at Murray Groat’s website here! Continuing my (entirely unplanned) series on different artists' portrayals of Tolkien's most liberated female character, Eowyn, above is a picture of her from the great Hildebrandt Brothers. 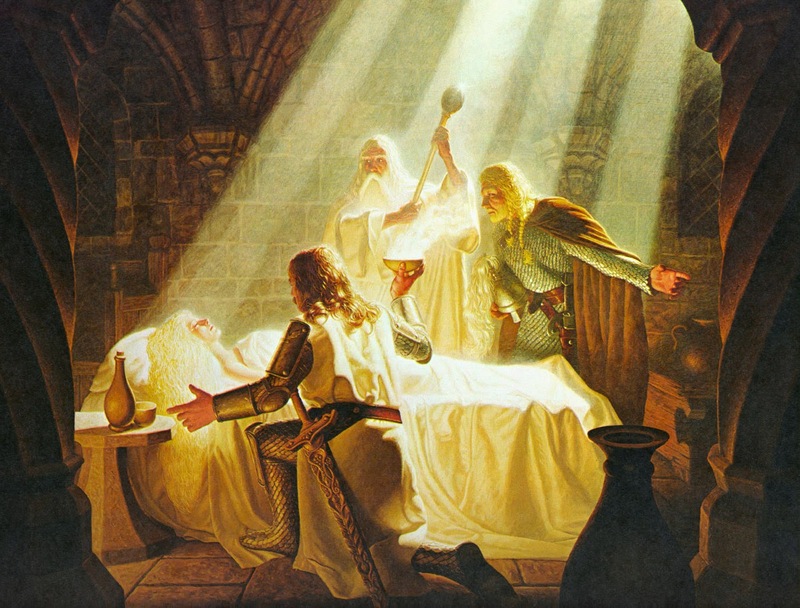 It depicts her recovering from the Witch-King's 'black breath,' being assisted by Aragorn's healing skills. Also in attendance is Gandalf and Faramir. 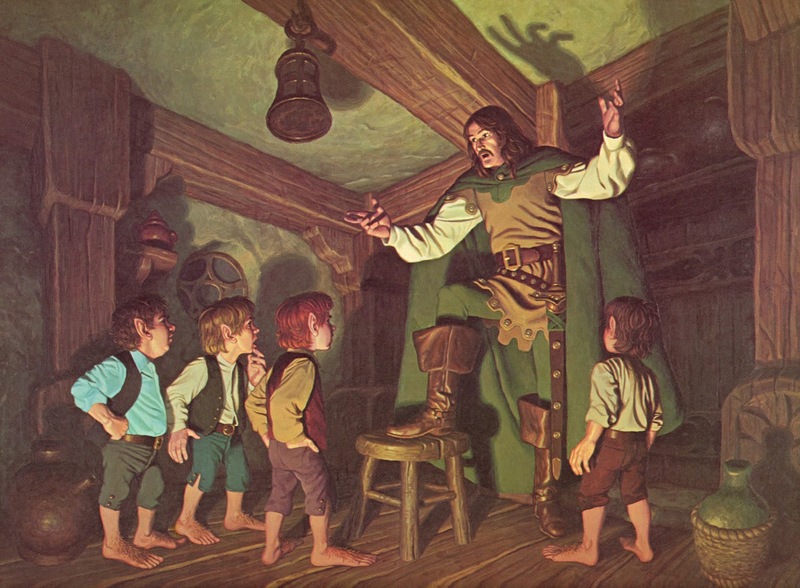 And here is one of my favourite Hildebrandt Brothers' Middle-earth pictures: Aragorn and the four hobbits at the Prancing Pony inn in Bree. In contrast to Frank Frazetta's 'cheesecake' portrayal of Eowyn (as discussed a couple of days ago in this post), I think that Angus McBride's portrayal of the Rohir shieldmaiden is spot on. I also prefer McBride's portrayal of the Witch-King. Notice that he has no visible body at all (no hands, arms, or head)! A subtle but disturbing detail. As the brawl which had consumed the common room of the Frozen Gem subsided, Adralat thanked his gaming companions, scooped a handful of coins into his purse and rose from the table. They had played Nine Fingered Whist, a game Adralat was not familiar with, but shared characteristics with other games he had played in other worlds. It was a case of bidding on certain cards to build certain tricks, with the betting based on projected trick strengths. He lost the first three hands but, by the fourth was getting to grips with the rules and, by the fifth, he had recovered the sums lost from the earlier hands. His playing companions were Wulz, a grizzled mate on a pirate ship from Dharijor; Eleus, a slave trader from the Purple Towns; Lodz, a one-eyed, wily crewman from Cadsandria; and Holym, a local man who affected the dress of Filkhar. The company was, to begin with, taciturn, but, as the game progressed and the ale flowed, they became more amenable and voluble. Adralat only sipped at his drinks, taking his time, and taking frequent sips of water to counter the effects. Adralat smiled. ‘Most certainly unmapped,’ he said. ‘ He watched as Holym played his Empress; a good move, but premature. Adralat held both the Emperor and the Knave. ‘What did you think of the stock?’ Lodz asked. Adralat shrugged. ‘Some nice specimens. That dark skinned warrior took my eye, but the finest were the final three.’ The group grunted and murmured their agreement. Holym answered. ‘That’s Nhagren, Boorg’s cousin. He runs the city. Boorg just gets fat, gets fucked and fucks the city. Its Nhagren who administers things.’ He played a Coin; a bluff, perhaps. 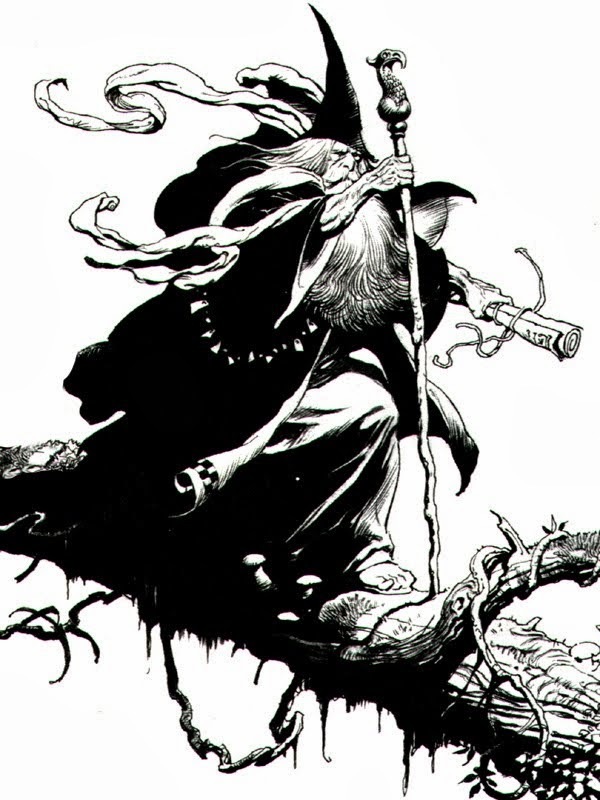 ‘The ugly one in the human cloak,’ Wulz said, ‘is Malagan. A sorcerer,’ He spat the word. Lodz passed his turn and so Adralat played the Knave he held. It trumped Eleus’s and would secure him the trick. ‘Are you sure you’ve never played Nine Fingered Whist before?’ Lodz said, gruffly. Adralat dealt the cards and spoke whilst doing so. ‘I’ve seen this Nhagren here in the inn,’ he said nonchalantly. Lodz answered. ‘Nice dog though,’ Adralat said. Lodz sneered. No one said anything as the trick played through and Eleus won it. Then he spoke. Wulz made a noise and laid down a card even though the energy of the game was now gone. ‘I sense you hated what you saw,’ he said. Eleus stood. He was shaking. Adralat collected the cards together. His face betraying nothing. 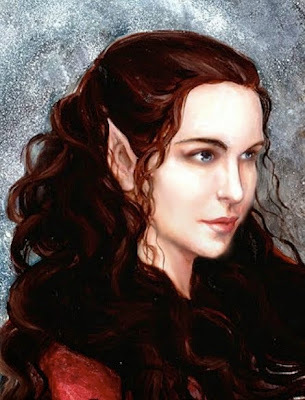 ‘Do you still dream, friend Eleus?’ The look in Eleus’s eyes confirmed the question. Adralat nodded. I am a huge fan of the work of Frank Frazetta. To this day, when I read a Conan story by Robert E. Howard, in my mind’s eye the Conan that I see is Frazetta’s Conan. 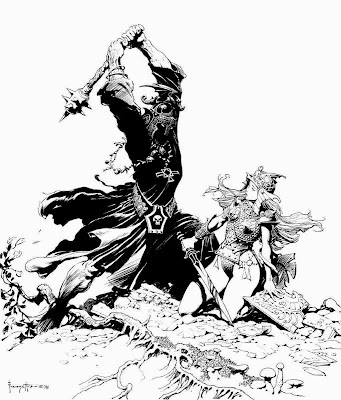 He probably is the greatest artist in the ‘swords and sorcery’ genre of the 20th century (although Michael Whelan certainly is a serious rival). 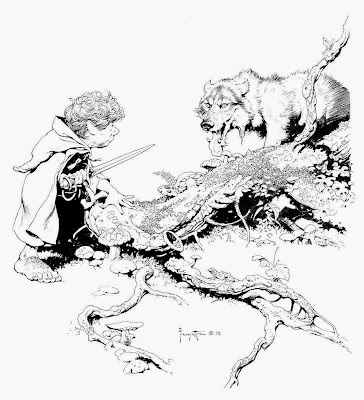 Nonetheless, when ‘Bree Yark!’ commented on my ‘Where the Wild Hobbits Are’ post that Frazetta had created a number pictures depicting scenes from J.R.R. 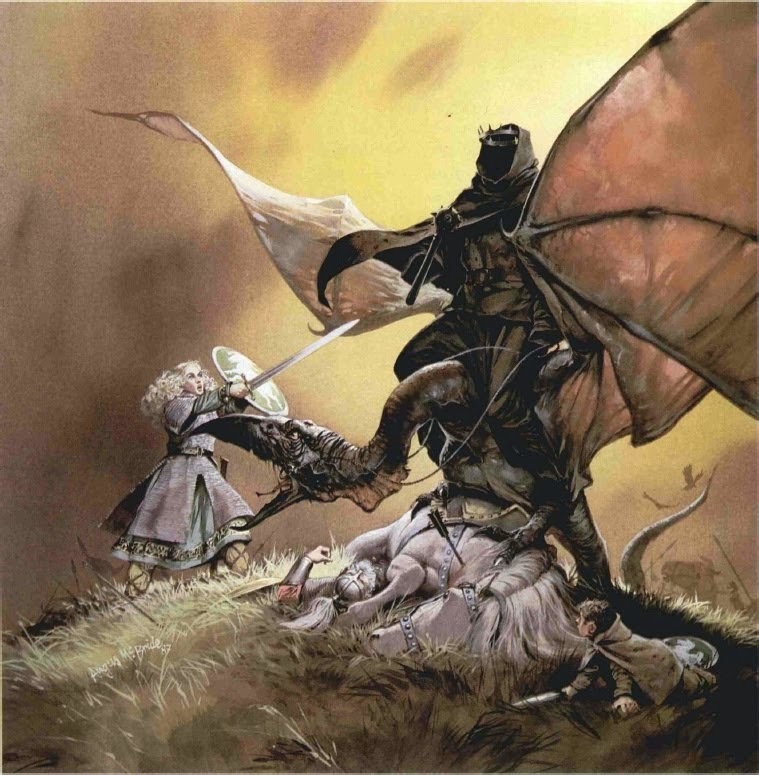 Tolkien’s The Lord of the Rings and The Hobbit, I immediate leapt to the conclusion that Frazetta’s style simply could not be appropriate for anything involving Middle-earth. Then Trey kindly provided this link. After looking at Frazetta’s Middle-earth pictures, I have to issue a mixed verdict. I can only imagine what Frazetta’s Galadriel or Arwen would’ve looked like! Our plan to purchase and liberate the Salamir family at the slave auction was a pathetic failure. I cannot believe that we did not consider requesting a large sum of money from the Empress in order to assist us in our mission! Uncertain of how to proceed, Adralat, Myluk, Bōdric, and I returned to our room at the Frozen Gem. We sat in glum silence for several minutes. “Cool?! Er, whatever. Begone human!” snapped Bōdric, clearly angered at our predicament. “But take Myluk with you to protect you from harm,” I advised as Adralat opened the door. Our burly warrior slave departed with the strange wanderer from another world. My half-brother and I sat in our room for the next three hours, alternating between brief frustrating discussions about what to do next and periods of resigned silence. At last we decided to head down to the common room ourselves to see what Adralat was up to, and to sooth our nerves with some of the alcoholic beverages consumed by the barbarians in this uncivilized crumbling outpost. As we descended the stairs towards the common room, we saw that it was full of rowdy sailors, merchants, soldiers, and less respectable types, engaging in a wide variety of activities: gambling, telling jokes, singing (poorly), accosting serving wenches, and – above all else – drinking. The patrons seemed to be from every one of the Young Kingdoms, united only in their vulgar manners and savage hedonism. Overseeing the broiling chaos with the serene calm of a Lord of Law was the innkeeper Zheren, puffing away at his clay pipe. Suddenly, much to my surprise, the stick-thin Pan Tangian whom we had spied earlier in the day leading Governor Boorg’s entourage at the slave auction – the wan administrator known as ‘Nhagren’ – stormed into the common room. He screamed the name ‘Aneera’ at the top of his lungs several times, irritating my delicate ears. 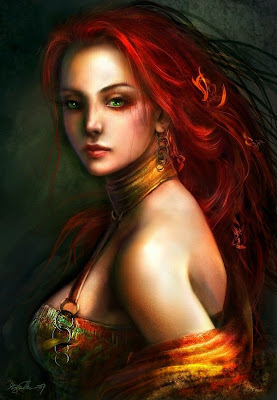 Eventually, a rather comely red-haired courtesan appeared. The Pan Tangian grasped her wrist and departed abruptly with her for the ‘entertainment’ rooms on the second floor of this den of iniquity. Bōdric and I made the rest of our way down the stairs into the roiling horde of unwashed humanity, weaving our way to the bar with some difficulty. We ordered a couple of murky blackish ales – apparently the least unpleasant beverages on offer here. As we left the bar to find some seats, I accidentally spilt some of my ale on a brutish fellow sitting at a table with another similarly brutish fellow. “My apologies,” I said in my least condescending tone, hoping to avoid any further interaction with the gruesome animal. “Oi! Oi! Pig! You’ll pay for messing me cloak!” shouted the savage, as he leapt to his feet in order to assault me. Silly idiot. I’m a sorcerer. Around us the rest of the common room had descended into chaos, as additional brawls broke out. Like chaos-infected primates, the other common room inhabitants had decided to imitate our encounter with their own petty violence. Looking worried that the fool’s yelping might attract further unwanted attention – despite the wild mêlée swirling about us – Bōdric quickly knocked him out with two rapid strikes with the pommel of his sword. Across the room we spied Adralat calmly gambling with some rogues, apparently undisturbed by the madness churning around him. Behind our strange human companion, like a protective demon, Myluk stood guard, pounding any fool who approached the table into immediate unconsciousness (or perhaps even death). Glancing at each other, Bōdric and I silently agreed to return to our room immediately, rather than trying to join Adralat. "The Hobbit illustrated by Where the Wild Things Are creator Maurice Sendak? It almost happened, but didn't, and all because J.R.R. 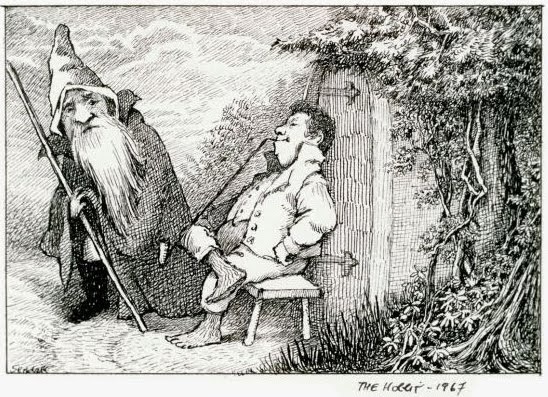 Tolkien got miffed, putting a stop to what might have been the greatest edition of The Hobbit ever." The morning after our arrival in the squalid, degenerate city of Ryfel, Adralat, Myluk, Bōdric, and I headed over to the market square in order to observe the slave auction and, hopefully, purchase the freedom of Lord Salamir and his family. An impressive group entered later in the morning. In front was an important looking, stick-thin Pan Tangian (whom we later learned was named ‘Nhagren’). Behind him was a palanquin born by mighty, sweating slaves. Inside the palanquin was one of the most corpulent creatures I’ve had the misfortune of gazing upon. Truly, this creature had abandoned his humanity long ago, degenerating into a horrific sphere of adipose. Apparently this blob was none other than the Pan Tangian governor of this backwater port, one ‘Lord Boorg.’ Both Pan Tangians were accompanied by a large number of the ‘black guard,’ the Pan Tangian soldiers who maintain some semblance of order in Ryfel. At the back of this band was a figure even stranger and more disturbing than Governor Boorg – a Pan Tangian covered in tattoos that appeared to be runes, and dressed in a cloak made of (I believe) human skin. This manifestly malevolent human wore a necklace of bones, had bones placed in his hair, and a bone shoved through his nose. Clearly a sorcerer of some kind (we later learned that his name was ‘Malagan’), he was accompanied by a massive wolfhound – or so it looked at first glance; the beast could very well be a demon of some kind, given its size and demeanour. The auction continued for a few more hours, with Governor Boorg purchasing many attractive women and strong men (presumably the former for his harem and the latter for his gladiatorial pits). No one dared to bid against the grotesque governor. After some time a number of mercenary warriors, all dressed in blue, arrived at the square. They were led by a well groomed blond fellow with brilliant blue eyes, who, like his men, also was dressed all in blue, and who looked like some kind of aristocrat. The ‘Blue Captain’ (as I referred to him in my mind’s voice) alone seemed uncowed by Governor Boorg and his entourage. Intriguingly, Bōdric claimed to recognize the mercenaries. Apparently he had come across them at some time during his many travels throughout the Young Kingdoms. To my half-brother’s obvious frustration, though, he could not place the mercenaries, or name their leader. After some time there was a commotion at the edge of the market square, as some late traders arrived with three slaves covered in hooded cloaks. Once the slaves were ushered onto the auction stage by the auctioneer Manirez, their cloaks were removed, leaving them shamefully naked, and revealing them to be the Melnibonéans whom we sought: Lord Salamir, his wife, and their daughter Cora-Dru. The bidding for each member of the noble family began at 500,000 silver coins. Blast – by the Grey Lords! The absurdity of our ‘cunning plan’ to purchase the aristocrats with our own money slapped my stupefied mind like a cold wet fish. There was nothing for us to do but observe who purchased the Melnibonéans. Governor Boorg and the ‘Blue Captain’ entered into a bidding war for each Melnibonéan. In the end, Boorg purchased Lord Salamir and Cora-Dru, whereas the ‘Blue Captain’ succeeded only with Lady Salamir (our lowest priority, given our instructions from Empress Sathril and Prince Quire). Unlike all of the other slaves sold today, none of the Melnibonéans were branded. I was grateful that, at least, they were spared this painful indignity. Boorg, his entourage, and his newly purchased slaves left the square, heading for the massive Black Citadel at the edge of Ryfel. We decided to follow the ‘Blue Captain’ and his mercenaries, trailing them (thanks to our slave Myluk’s skill) to a ship at the docks. The ship bore the markings of the Isle of the Purple Towns. At least we now knew, roughly, where all three of the Melnibonéan captives were held.